Pennsylvania Gov. 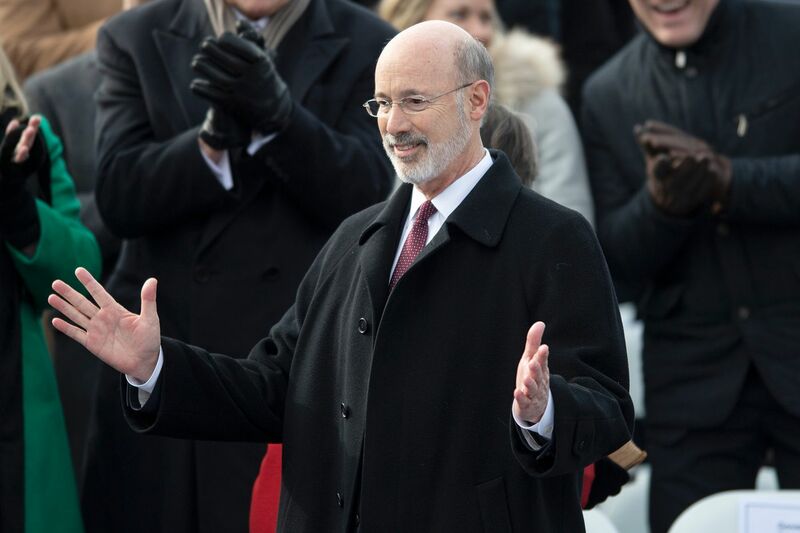 Tom Wolf at his second inauguration last month. HARRISBURG — Gov. Tom Wolf on Tuesday unveiled a $34.1 billion budget that would boost funding for public schools, raise the minimum wage, and help counties update their voting machines, while steering clear of the broad-based tax increases that sank some of his earlier initiatives. The Democratic governor’s budget — his first since reelection — was a return to some of his more progressive wishes and a nod to the realities of negotiating with the Republican-controlled legislature, which has refused to consider increases in the state sales and personal income taxes. Still, Wolf is seeking other changes that have been rejected in the past, among them a severance tax on natural gas — albeit, this time one that would be dedicated to refurbishing aging infrastructure instead of propping up the state’s general fund. That tax proposal is not in the budget, which must be approved by June 30, but is expected to be part of the overall debate. “In the coming weeks, we’ll have the chance to discuss, debate, and negotiate the details,” Wolf told a joint session of the legislature in his 27-minute speech. After the speech, Republicans struck an optimistic tone, saying they thought there were many areas where the two sides could agree. Senate President Pro Tempore Joe Scarnati (R., Jefferson) said he was “pleased” with Wolf’s overall message, but warned there are other policy changes that the governor did not address but that he believes are necessary. That includes a reduction in the state’s 9.99 percent corporate net income tax and an emphasis on cutting expenditures. “This budget is not just going to be a slam dunk,” Scarnati said. To pay for it, Wolf is relying on a projection that revenue from taxes and fees will grow 2.6 percent — or nearly $900 million — in the next fiscal year. The plan also counts on people making a higher minimum wage paying more in sales and income taxes; and raising new dollars from a new fee on State Police coverage in municipalities with no police of their own. Both are proposals the legislature has opposed before. On the spending side, Wolf’s plan calls for an additional $200 million in funding for K-12 instruction in public schools, an extra $50 million for special education and an additional $7 million for Pennsylvania’s 14 state universities. It also calls for educational-policy changes, such as raising the school dropout age from 17 to 18, while lowering the age at which children must begin attending school from 8 to 6. The governor also wants to set a $45,000 minimum salary for public school teachers, up from $18,500. That would affect roughly 3,200 teachers, many in rural districts, administration officials said. The four state-related universities — Temple, Lincoln, Penn State, and the University of Pittsburgh — would receive no boost over this fiscal year’s spending. Wolf, however, is proposing $8 million for grants to community college students who remain in the state for work. Outside of education, the governor’s budget proposes a $15 million increase to serve more people with intellectual disabilities who are currently on a waiting list for services. The governor’s plan includes $15 million to help counties cover the cost of updating their voting machines. Wolf’s administration last year directed counties to begin using machines that create a paper record of votes to verify the accuracy of results. The goal is to have the new machines operating by the 2020 primary. Counties have estimated the total cost at $125 million, and have balked at the expense. The administration has said it will propose similar annual infusions to help offset those costs, for a total of $75 million, over five years. Wolf will ask state lawmakers to raise the minimum wage from $7.25 per hour to $12 per hour starting in July, with additional increases coming each year until 2025, when it would reach $15 an hour. His administration expects the measure would save the state $36 million in the 2019-20 fiscal year, an amount it attributes in part to lower costs for social services. Republican leaders have repeatedly resisted attempts to increase the minimum wage, arguing that such changes should be driven by the marketplace rather than the government. The last change to the state’s minimum wage came a decade ago, when federal officials raised the rate. Wolf isseeking to raise $103 million by imposing a sliding-scale fee on municipalities that rely on the State Police for patrol coverage. The fee would range from $8 to $166 per person, depending on a community’s population. Wolf in the past has proposed a flat fee, which has been blocked by the legislature. And a debate is expected over Wolf’s effort to impose a severance tax on natural gas extracted through Marcellus Shale drilling. “You can’t escape it,” said Sen. Vincent Hughes of Philadelphia, the ranking Democrat on the Senate Appropriations Committee who supports a new drilling tax. The governor has proposed borrowing $4.5 billion over four years and dedicating the money to help fund disaster recovery and infrastructure improvement, the latter a longtime goal for legislative Republicans. The loan, the governor said, would be paid off using money from a severance tax. Republican leaders have resisted past severance tax proposals, citing potential harm to the natural gas industry. The Wolf administration has said the governor will take out the loan only if legislators approve the levy. Other areas of Wolf’s budget are likely to be easier sells. Both Republicans and Democrats on Tuesday praised the governor’s emphasis on enhancing work development and job training programs. Wolf, for example, called for creating a workforce “command center” to coordinate and streamline programs aimed at connecting employers with a trained workforce. “We have not had that kind of recognition that our government can be better organized to respond to workforce demands,” said Sen. Arthur Haywood, a Democrat whose district includes portions of Philadelphia and Montgomery Counties. The governor has also proposed dedicating additional money for agricultural projects, including $2.6 million to increase organic farming in the state and $2 million to create a center to help farmers create business plans. And he asks for a $1.5 million increase in funding to provide people with the opioid overdose-reversal drug Naloxone. Kate Giammarise of the Pittsburgh Post-Gazette contributed to this article.